There is an immense mine in a town called Wieliczka in the southern part of Poland at a depth of 1,027 feet and spreading over 178 miles. It is a truly gigantic place and up until the day it closed, it was among the oldest salt mines in the world. The beginning of this mammoth mine can be traced back to the start of the 13th century. At this time, rock salt was discovered for the first time in Wieliczka and thus the first pits were dug. Over the centuries, the mine kept expanding farther and deeper, with more shafts being added. 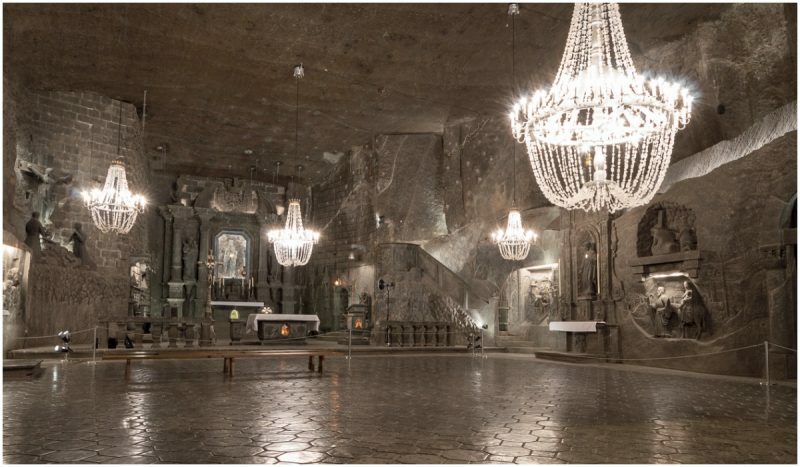 Given the sheer size of this place, it is no wonder that it became known as “the Underground Salt Cathedral of Poland.” Truth be told, this mine does, in fact, have a couple of cathedrals deep down in the darkness, where miners could say a prayer or two and ease their thoughts. The underground cathedral’s statue and monuments were hand-carved by the miners themselves, except for a few statues made in modern times.The largest of the chapels is called the “St. Kinga Chapel,” itself some 295 feet underground. Found within its dark gray walls are a number of statues that depict the most central moments in the life of Jesus Christ, such as the Crucifixion and the Last Supper. Even though these cathedrals are hundreds of feet below the earth’s surface, that doesn’t mean that they are any less luxurious than one above ground. In one of these chapels are two colossal chandeliers made exclusively of the salt crystals quarried from this mine. As a matter of fact, this place is so big that it has several chandeliers hanging from its ceilings, a bungee jump was successfully accomplished, and a windsurfer even glided across one of these vast chambers. Places this old are not without their fair share of legends, myths, and tales. One such legend is about Saint Kinga of Poland. Back in those days, Kinga was a princess who was about to become the wife of Bolesław V the Chaste, a duke of Sandomierz. For her dowry, she asked for nothing but a piece of salt, for back in those days, salt was a luxury item. For this purpose, the king took his daughter to a salt mine. Then the princess chose one of the pits and dropped the engagement ring that Bolesław had given her, and left for Poland. Upon her arrival in Kraków, she tasked the miners with the digging of a very deep mine pit. And they were to continue digging until they hit a rock. Once they did, the miners found a piece of salt. Upon splitting this piece of salt in two, the miners found the engagement ring. From that day on, the princess became the patron saint of the salt miners. Once the Second World War began, Poland fell under Nazi occupation. Thousands of forced workers were sent deep down this mine, where the Germans had built an armament factory. But things took a different turn and the Germans never got a chance to activate this factory, for the Red Army was closing in. The mine was officially closed in 1996, for the prices of salt took a nosedive, which subsequently meant that the production no longer justified the costs. On the other hand, the miners were in a constant battle with the water table anyway, and the shafts were all too often flooded. Today this salt mine is a popular tourist attraction. A great number of famous people, scientists, writers, and composers, such as Dmitri Mendeleev, Nicolaus Copernicus, Johann Wolfgang von Goethe, and Fryderyk Chopin, among others, have seen it. A rough statistic indicates that so far 40 million tourists have come to marvel at the utter beauty of this underground wonder of the world. This entry was posted in Europe, History, Poland, Travel, World by rolyred. Bookmark the permalink.